From duo with keyboard to full big band, 3x40 minutes or 2x1 hour sets, recorded music in breaks. Kevin O’Brien is now firmly established as one of the country’s leading exponents of Sinatra-style singing. 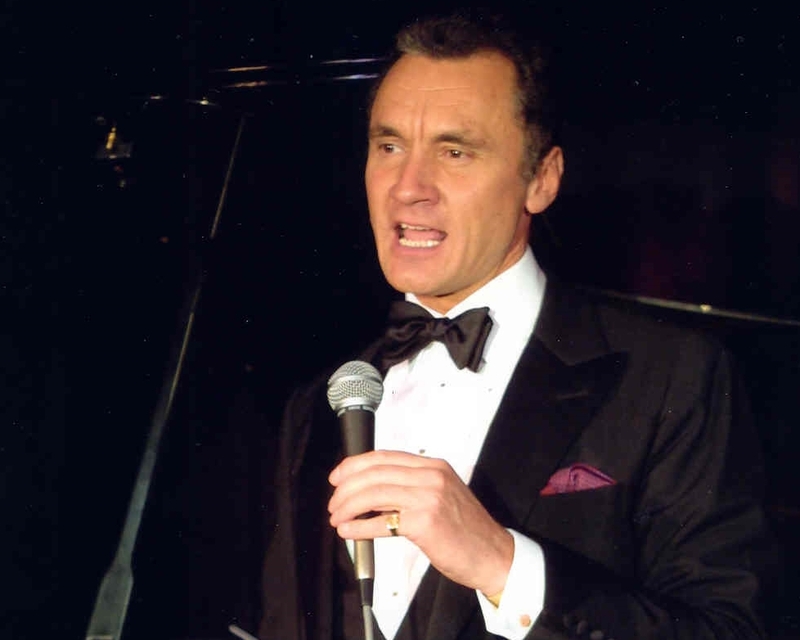 Star of several ‘Tribute to Sinatra’ concerts, Kevin has performed at the Royal Festival Hall, London Palladium, Talk of the Town, Victoria Palace, and at London’s top ‘jazz rooms’ the Pizza on the Park and Pizza Express, Soho. He has also toured internationally, appearing at the Mint, Marina, Stardust, Dunes, Alexis Park, Sahara and Sands hotels in Las Vegas and at clubs and festivals in the States, Australia and Europe. Kevin makes clear that he is not a Sinatra imitator, but his singing is a celebration of the genre – relaxed, swinging, sophisticated and stylish – drawing on the wonderful Sinatra repertoire of classic ‘standards’ and occasionally including some of his own tasteful compositions. Kevin combines his touring and club appearances with performances at private functions including weddings, parties and corporate receptions, and he was booked through Function Junction a few years ago to provide the live music for Joan Collins’s wedding reception as featured in OK magazine. Joan rated his performance “excellent”! Kevin is backed by top musicians, all of them British jazz ‘names’ in their own right. Our quoted price is for Kevin and a trio of piano, bass and drums, but he can also appear with a just a pianist or with a bigger group – even up to a full 17-piece big band. Kevin normally performs two 40-minute sets, but this can also be varied to suit the occasion. Kevin O'Brien is based in London. See Pricing for details of travel costs, etc. "The band were great and everyone gave very positive feedback on the band and the music they played. Please thank Kevin for us"
"A true gentleman and professional." "Just a little note to say a very big thank you for the brilliant show you and your band put on for our wedding day ….. Everybody loved the music and we had so many compliments about you in the thank you letters. We have had a good look at the DVD and you really are super in it. Thank you also for taking the time to work with my singer friends. It meant so much to both of us and we really appreciate the extra work you did. I do hope to have the fortune to see you perform or book you again ..... perhaps my 40th?" "Kevin and his pianist were great. They set the scene perfectly for our wedding." "Kevin was a class performer and the guests were suitably appreciative." "Excellent band, so many people commented on how good they were." "Kevin O’Brien and his musicians were absolutely wonderful, a highlight of the wedding reception. Many guests commented on how superb they were." "Kevin and the band were fantastic." "Would definitely recommend the band and Function Junction – helped make our wedding such a memorable day." "It has been a pleasure to deal with both Function Junction and Kevin O’Brien – many thanks to all." "We were delighted with the standard of Kevin and the band – thanks." "… a singer ‘a la Sinatra’ whose voice and charm created a most agreeable element to the evening." "Kevin O’Brien has a rich and vibrant voice, and his interpretation of a lyric always brings something fresh to a the classic songs while adding a grandeur to the new. A pleasure to see and hear." "O’Brien, a classy entertainer from London, sings ballads as they should be sung, in a style similar to Vic Damone." "Kevin O’Brien is the hottest male vocalist on the scene at the moment." I Get a Kick Out of You ..